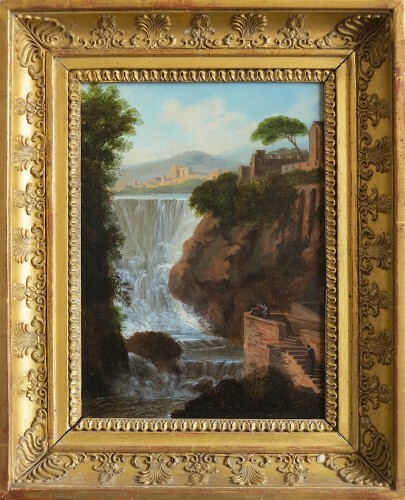 Few biographical details are known to us about this artist, yet almost continuously exhibited at the Salon from 1801 to 1831. 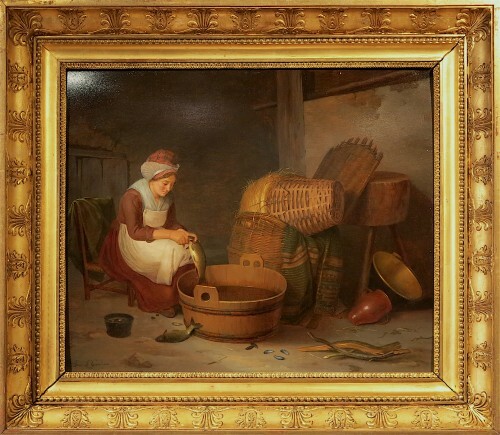 Born in Paris, she was a pupil of the painter François Leroy de Liancourt (1741-1835), specializing in kind pastoral scenes. 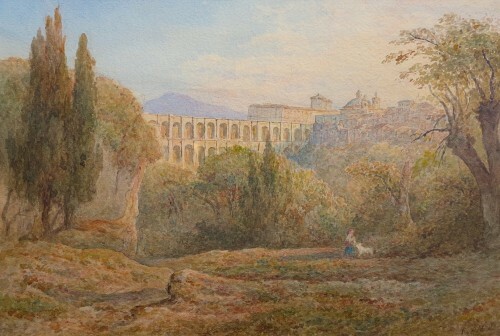 She exercises, in genre painting under the Empire and the Restauration, in a personal style, the domestic interiors (kitchens, barns …) in peaceful and silent atmosphere, animated by one or some characters, Few biographical details are known to us about this artist, yet almost continuously exhibited at the Salon from 1801 to 1831. Born in Paris, she was a student of painter François Leroy de Liancourt (1741-1835), specializing in pastoral kind of genre scenes. 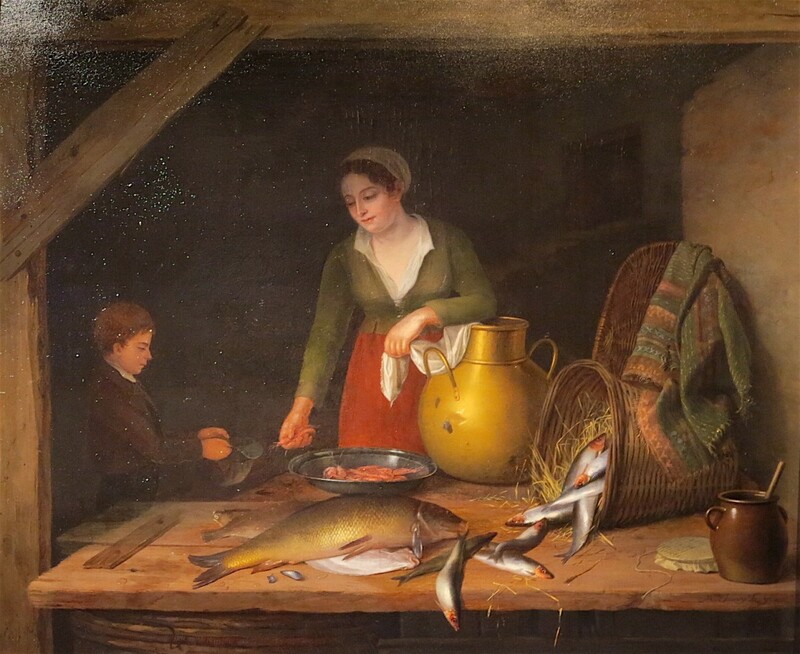 It exercises, in genre painting under the Empire and the Restoration, in a style all its own, the domestic interiors (kitchens, barns …) in peaceful and silent atmosphere, animated by one or some characters, reminiscent, both in smooth and neat invoice in the theme, reminiscent of the Flemish paintings from the early seventeenth century. In general, the critics of the time praise her precise and meticulous faculties imitation of everyday objects, but consider her somewhat laborious style. Indeed, while excelling in the rendering of the brass, baskets, glazed stoneware pottery, linens, brooms or food, she performs her figures with less verve. But these are the objects that are the stars of her compositions, and graceful exercise works in real final seduction. 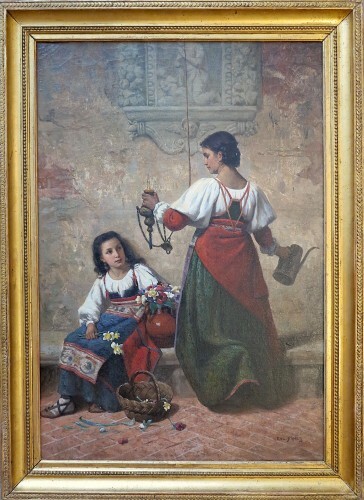 Outside the Salon of Paris, Mademoiselle Legrand regularly participates in province Salons and exhibitions, particularly in the north like Lille, Douai, Arras and Cambrai region probably very sensitive to the Flemish atmosphere of her compositions; she also won several medals and awards in the 1820s. Another sign of recognition of his talents, the presence of two of his paintings in the collection of the Duchess of Berry, who buys an Interior of a kitchen at the occasion of the Salon of 1819, and an Interior of a barn dated 1821, both lithographed by Féréol Bonnemaison. 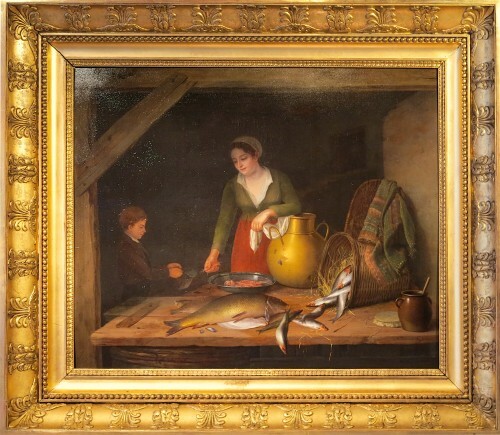 At the 1814 Salon, where she is resident at the 20, rue des Moulins in Paris, she is virtually the only artist to exhibit this type of ‘rustic’ Flemish inspiration paintings; this edition of the show will also comprising almost no lifes or intimate genre scenes. This style is generally not very present in France in the early nineteenth century, its main representatives being Martin Drolling or Marc-Antoine Bilcoq, and Jean-Baptiste Charpentier, the latter being more rooted in the eighteenth century. However, these artists put more value in the characters of their compositions than does Jenny Legrand. 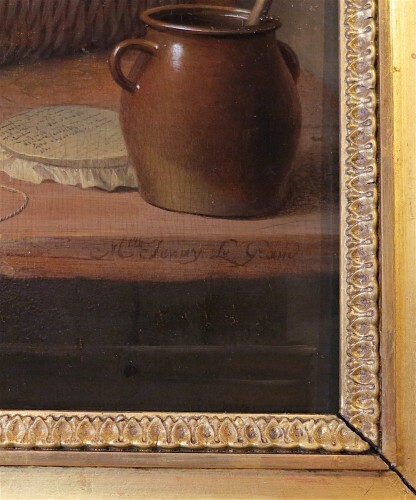 The range of our paintings, relatively off and in brown tones, remind the Lenain brothers. A young mother prepares a meal of seafood; in a dish of prawns or scampi, she draws some to put them into the hat for his son came begging. Spread on a table, there are three soles and a river fish, a carp, recognizable by its large scales and its hollow tail, while a cart overturned escape sardines. This type of rustic scene with adults and children is often found in the paintings of Gaspard Gresly (1712-1756), Franche-Comté artist specialized in depictions of ordinary people. 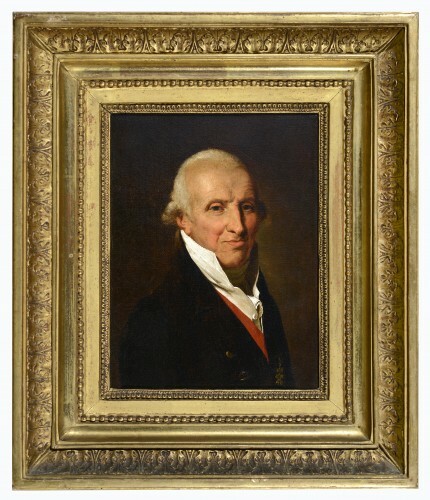 The Salon handbook indicates that the number 615 was “executed by the new process invented by Mr. Paillot Montabert” which itself exhibited two paintings with his process. 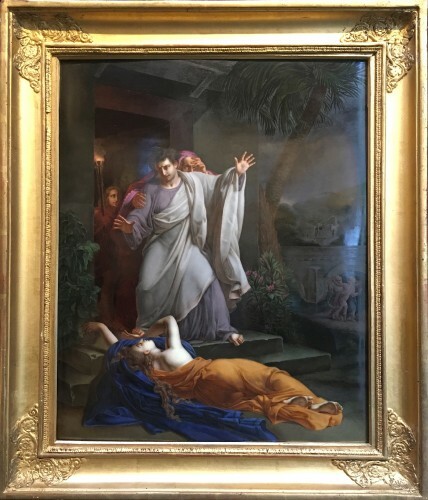 This painter from Troyes (1771-1849), who was a pupil of neoclassical Benoît Suvée and Jaques-Louis David in the early nineteenth century, is more remained in the history of art as a theorist, with several books including the best known is the ‘Complete Treatise on painting‘. But he obtained at the time a certain reputation as a modernizer of encaustic painting, according to a new process which he will tirelessly claimed authorship, and that would have convinced such seasoned artists like Jean Alaux, François Édouard Picot and Abel Pujol. This technique was used on rigid and absorbent substrates, wood in particular; in short, it was, with the aid of a heating system, to merge different layers of paint, to ultimately do not have one. The method had many advantages such as easy retouching, relief and transparency, excellent color stability and moisture resistance or worm attacks. But his preparation time required and its application a real know-how. Among the followers of this technique, we find Eugene Delacroix (with for example the picture of Saint-Sulpice Jacob Wrestling with the Angel), or Jasper Johns closer to us.